(JTA) — It has been more than 35 years since Harvey Fierstein’s “Torch Song Trilogy” opened on Broadway. At the time it was a theatrical revelation: Who could have imagined that the story of a young gay Jewish man’s quest for love and validation in a world that viewed him as an abomination would become such a hit? Fierstein, who wrote and starred in the original production, won the Tony Awards in 1983 for best play and best lead actor, and rocketed to theater stardom. The play is back on Broadway in a slimmed-down production — it’s over an hour shorter than the three-part, four-plus hour original and is just called “Torch Song.” It stars Michael Urie (of “Ugly Betty” fame) as Arnold Beckoff, a professional drag queen, and his performance is so funny, moving and sensitive that it could win him a Tony, too. It opens Nov. 1 at the Hayes Theater and will run through Feb. 24. 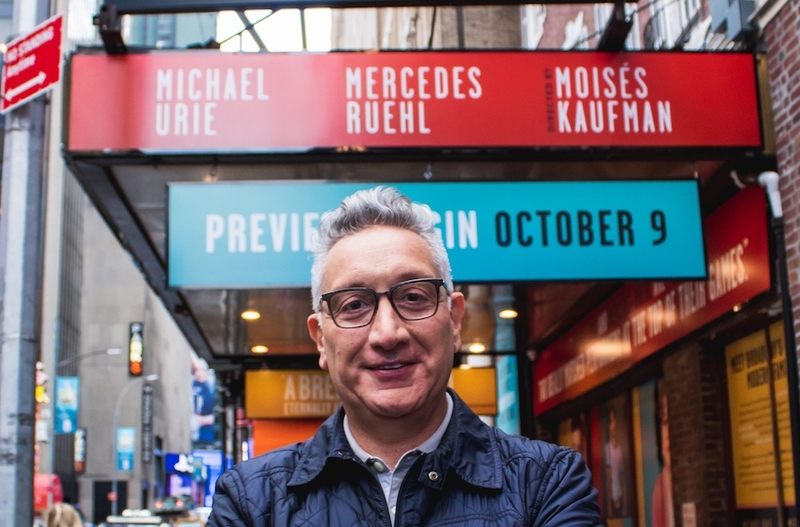 Kaufman, 54, was still a teenager when he caught a performance of the show by a touring company in San Francisco while on vacation from his native Venezuela. The play was one of the reasons Kaufman set his sights on the New York theater world, a long way from his native Caracas, where he was born and attended a yeshiva through high school. His father emigrated there from a village along the Romanian and Ukrainian border when he was 20. He had survived the Holocaust through making and selling the yellow Stars of David that Jews were compelled to wear by the Nazis. In Caracas, he married a Venezuela-born daughter of immigrants from Kiev. “Torch Song Trilogy” struck a chord with Kaufman on multiple levels. He calls himself still very “spiritually” Jewish today, and the show also has a very Jewish sensibility — from the Neil Simon-inflected humor to its multiple Yiddishisms. In the show’s opening moments, Beckoff offers a funny and sad soliloquy admitting to himself and the audience that he just wants someone to say “I love you” and mean it. He ultimately finds that someone, though that ends badly — as does the visit of his widowed mother (Mercedes Ruehl), up from Florida, who still holds out hope that her son eventually will blossom into heterosexuality. Kaufman said he finds the story prophetic today. After attending New York University, Kaufman co-founded the Tectonic Theater Project in 1991 with Jeffrey LaHoste, his future (and current) husband. The TTP became one of many small theater companies in New York City that produces often nontraditional projects off- and off-off-Broadway. They are staffed by young writers, directors and actors seeking opportunities to strut their stuff. Kaufman’s first big success didn’t come until 1997, when he wrote and directed “Gross Indecency,” about the infamous trial involving Oscar Wilde’s gay affairs that shocked Victorian society. Just a year later Matthew Shepard, a gay University of Wyoming student, was beaten, tortured and left to die on a fence pole in what was widely seen as a hate crime. The profits from “Gross Indecency” allowed Kaufman and members of the TTP to travel to Laramie and interview members of the community. Their subsequent work, “The Laramie Project,” became one of the most performed plays in the country, in both professional settings and in high schools and colleges across the country. Although it’s a coincidence that “Torch Song” opens almost exactly 20 years after Shepard’s horrific murder (on Friday, his ashes were placed in a crypt at the Washington National Cathedral), Kaufman said the anniversary serves as a reminder that the themes of Fierstein’s play continue to resonate. “Many kids who come out to their parents today still get the same response that you see in the play,” he said.